There are few other times along the Texas Gulf Coast when anticipation runs as high as the Summer months when the “Sweet Southeast” wind blows green water to the beach and the Surf Fishing heats up. 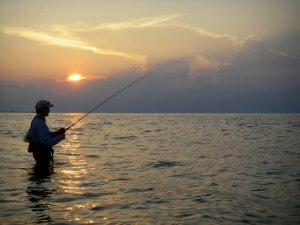 When this occurs, wadefishermen line up almost elbow to elbow along the beachfront to catch speckled trout and many other species of gamefish. Surf Fishing is open to everyone willing to answer the early wake up call. The “Dawn Patrol” is what it's called, and there is tremendous potential for those that time it right and follow some important tips. Some safety precautions are also in order as surf fishing is unique in the demands it places on fishermen. Read on to learn how to take advantage of this special time along the coast and what to bring to make the most of your time on the water. To time it right you'll need to keep an eye on the weather forecast, surf cams, tide chart, and wave height predictions. Staying active in the fishing forums will also help, although you might get the reports and that “should have been here yesterday” feeling. You're looking for a few days of Southeast winds to bring green water towards the beach. Then you're looking for the winds and wave heights to calm a bit. And you're looking to fish the surf on an incoming or high tide. Surfcams are a God-send here as well as a good marine forecast. The Southeast wind pushes clearer water towards the beach. I say clearer because it will be best when you have 2-3 feet of visibility, not gin clear. You're looking for sandy green, and often this occurs early in the weather pattern. The calming I'm talking about will let the wave height fall and make it a lot easier to fish. It's no fun jumping waves. It can be dangerous and make it miserable to fish. Here are the Surfcams you can use to see what the water looks like and how rough it is. Keep in mind that the waves are bigger than they appear in the cams. Surf Fishing puts demands on you and your equipment unlike any other saltwater fishing. It feels like you're getting pulled on. Anything that is loose will loosen further and fall off, and everything else will get loose. The key here is to keep it simple and secure everything really well. The one exception to securing everything is your stringer, and we'll tackle that in the Safety paragraph. Plan on wearing some type of darker colored lightweight pants, with nylon or some type of blend being best. The old school pluggers wore jeans, which are dark but get really heavy and uncomfortable when wet. I recommend pants if you run into jellyfish or a stray hook, and a lightweight fishing shirt. Polarized sunglasses and a hat are a must, and a wading box with a shoulder strap works very well. Grind Terminal Tackle makes these wading boxes as well as the best stringer on the market. The where is relatively simple. Start with the beachfront closest to where you live. If you're in the Houston metro area, that means you'll be looking between Galveston and Surfside South of Lake Jackson. Starting in Surfside and heading Northeast along the beach you'll find miles of fishable water towards San Luis Pass. Same goes for the other side of the pass towards the Galveston Seawall. There is plenty of beach to fish all the way to East Beach in Galveston just South of the jetty. It's a good idea to look for structure when Surf Fishing. Structure can be submerged rocks, rock groins you can wade out on, jetties, and underwater depressions and washouts. But there is structure in the forms of sand bars and guts no matter where you are. The bars are the higher areas where waves rise and begin to break. And the guts are the depressions. For more specific information on “spots”, including those outside of the Galveston area, I recommend purchasing one of Ray Crawford's books on wade and kayak spots along the Texas Gulf Coast. They can be found in the store, and will serve you well. First thing to remember is to be there before daylight. During the night and in the early morning hours fish will cruise the surf, often time in the first gut closest to the beach. So when you get there you'll want to start fishing before your feet get wet. You also want to fan your casts in the gut, diagonally, and then as far as you can sling it towards the horizon. And once you cast, a really important tip is to let your lure sink to the bottom before bringing it in. And as you bring it in work it close to the bottom. It will come up in the water column be the time it gets to you. Speaking of the water column, topwaters are also very effective when Surf Fishing. Blow-ups can be violent and thrilling, and I love to start my day with a topwater to take advantage of this possibility. As the sun gets up, however, most often soft plastics, sinking plugs, and weighted jigs will work the best. The fish move out as the sun gets up, so you'll want to follow them from where you started in the first gut. For more information on Surf Fishing Lures, head to the Fishing Lures page - Saltwater Fishing Lures. When the surf runs clear you might not have as many hits from speckled trout, but you might get into spanish mackeral or other toothy, strong fish. It pays here to keep a large silver spoon pre-rigged with a wire leader in your surf fishing box. Be very careful as you get into deeper water. This is a good time for some safety precautions. First off, it's always better to have a fishing buddy than to be by yourself. If you're going to Surfside Beach on a weekend when the water looks good, you won't have to worry about being alone, but if you're fishing during the week you might have it to yourself. Second, some type of life jacket or readily inflatable PFD is a no-brainer. You might be tempted to swim to the next bar to reach a little further out with your casts. I can't say I've never done it, but I wouldn't recommend it and certainly not if you're by yourself or don't have some type of safety equipment. Third, you're in there with the fish, including jellyfish, stingrays, and sharks. Keeping an eye out for jellyfish will help you avoid their painful sting and so will wearing pants. Stingrays can be avoided by shuffling your feet and keeping an eye out as well. And lastly, always tie a slip knot in your stringer rope once you start catching fish, and let the rope out to keep it away from your body. Yes, It's Early, But You Gotta Be There! My wife thinks I'm nuts when I set the alarm before a surf fishing trip, and that's the first thing to keep in mind. The action starts before the sun comes up. So it pays to be there before daylight. This means a really early wake up for suburbanites in the Houston area, but if you're going to go you might as well get there early and give yourself every advantage you can. You're going to be tired the rest of the day, but it's a good tired. Good tired because for the rest of the day you'll be walking around a bunch of folks who have no idea how pretty the sunrise was over the Gulf and have no idea how hard those specks hit! When the green water gets to the beach and it calms down enough to wade, you have to go. Monday, Wednesday, Friday, or whatever day, you have to be there. Make every effort to get down there when the conditions are right. This is important for a couple reasons...First, the best fishing might not wait around for the weekend. Second, the crowds will certainly be there for the weekend, and if you can get a little more space it's ideal. But if the weekend is when you can go, then don't let that deter you. Surf Fishing can be magical along the Texas Gulf Coast. It's easily accessible, and the catches can be phenomenal. So keep your eyes on the cams and the weather, and get your list of buddies on speed dial so you can experience the beauty of the Dawn Patrol! Return from Surf Fishing to the SFT Home Page.